but it does take care of a wide range of them. 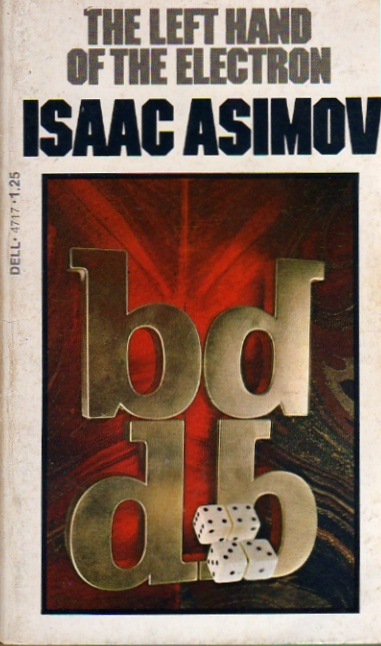 In seventeen complete and witty discussions, Isaac Asimov talks about six of his favorite problems. What’s so special—chemically—about water? Was Shakespeare’s science any good? Are yin and yang valid scientific principles? Maybe these aren’t the questions that keep you up at night, but the facts behind them are among the most fascinating in the world. Who could explain them better than the fabulous Isaac Asimov? This is an unusually solid F&SF essay collection with an unusual number of memorable essays. The book starts out with a series five essays long (!) on symmetry in some of its manifestations in the various sciences. The next three are a topic of particular interest to science fiction fans and writers (real or potential): realistically, just what are the various chemical substances out of which one could make a world-girdling ocean? Following these are three mathematics essays, not in a series (whew), about prime numbers and number bases, and about Euclid’s fifth axiom—two essays relating to the latter topic, which I heartily recommend. “Holes in the Head” is about classification (just how does one classify a duckbill platypus, anyway?) and begins with a short complaint on how hard it was for Asimov himself to figure out just how many “books” he’d written (what’s a “book”? )—a point dear to the heart of some of us. “The Eureka Phenomenon” is about sudden discoveries in science, and “Pompey and Circumstance” is a cute little piece on coincidence in history (not to mention having just about my very favorite title of all of Asimov’s F&SF essays). These are followed by “Bill and I” in which Asimov vents some of his frustration with critics who were less than pleased with Asimov’s Guide to Shakespeare. The last two essays are once again on population. Of the seventeen essays here, very nearly all seventeen are memorable and worth-rereading, which is a rather high average, even for Asimov, leaving this book one of the best of his essay collections from the 1970’s and, indeed, among the best of his whole career.